In the wake of the CEO ousters at HP, Yahoo and Nokia and the CEO implosions at Cisco, SAP, RIM and Dell, it’s surprising people are still picking on Steve Ballmer. Hedge funders are calling for his head. Employees are complaining. I am by no means a big Microsoft fan — during my five-year tenure at Sun Microsystems, Microsoft was a vicious, scorched-earth competitor. But I have to give credit where credit is due: Ballmer has done a remarkable job, especially in contrast to the leaders of most technology companies. Ballmer’s problem is that everyone expects Microsoft to be as good as Apple at entering into new markets. The reality is that Microsoft has never been a technology innovator. People are nostalgic about the days of Bill Gates, when Microsoft supposedly innovated. However, under Gates, Microsoft copied other products relentlessly, even from its very beginning. MS Basic copied Tiny Basic. MS DOS copied CPM-86. Windows copied the early Mac OS. Word copied WordPerfect. Excel copied Lotus 1-2-3. Access copied FoxPro. Windows Server copied Novell Netware. Exchange copied Lotus Notes. Internet Explorer copied Netscape Navigator. C# and .net copied Java. All Microsoft has ever done is enter markets late and invest and iterate until it wins. On top of that, Gates used monopoly position to force adoption of ensuing products, a luxury that Ballmer has not had. 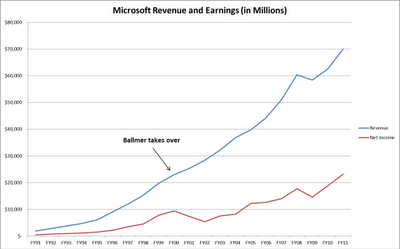 During Ballmer’s 10-year tenure, Microsoft has tripled revenue and doubled net income. Legacy products such as Office, Exchange and SharePoint have been transitioned to the cloud. Windows 7 is a huge hit with over 400 million licenses sold, and early looks at the upcoming Windows 8 are resulting in rave reviews. Windows Phone 7 is a very late entrant into the modern smartphone category, but it is already being declared the number three player, with its innovative user interface and upcoming distribution via Nokia. Some analysts even predict that it will outpace Android within a few years. Even more importantly, Ballmer has shepherded Microsoft as a big player in two new and growing markets: console gaming and search. The Xbox now has 20% market share in the console market, with 45% year-over-year growth, and has led the way to motion-based gaming with its hit Kinect product. According to Comscore, Microsoft’s Bing search now has 31% of the US search market due to its distribution deals with Yahoo and others. While some lament the amount of money Microsoft is losing on Internet services, the ad dollars will soon start to follow the eyeballs, as I personally experienced during my tenure at Webtrends where we provided search. The scale of the losses has to be put into context with the scale of Microsoft. Yes, losing $2 billion a year on online services sounds really bad. Losing $2 billion per year to gain 30% of a $30 billion and growing market actually makes a lot of sense, especially when you are delivering $70 billion in revenue and $24 billion in profits. Microsoft lost billions on Xbox and is now in a leadership position in that market, and it will follow that same strategy with Bing search and Windows Phone. The reality is that Apple and Microsoft are the only large technology companies that have been able to create new products. Cisco continually bought companies to grow their revenues until the party ended. Oracle and IBM have had the same strategy as Cisco and will both soon run out of legacy application and middleware vendors to acquire. Nothing new has come out of HP, SAP or Dell in a decade. Although they both create new products from scratch, Apple and Microsoft have very different DNA. Apple creates new markets, and Microsoft eventually dominates them. Steve Ballmer is not going to be Steve Jobs, who is widely lauded as perhaps the greatest CEO of our time. Even Apple can’t get another Steve Jobs and now has a COO running the company. 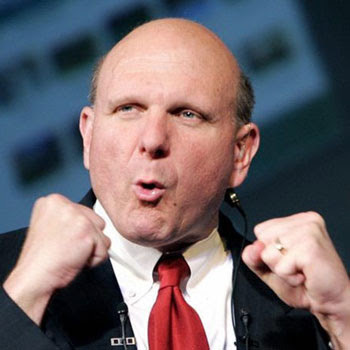 Who do detractors think Microsoft should replace Steve Ballmer with? HP has gone through three CEOs in a year and ended up with Meg Whitman, a non-techie whose core eBay website to this day looks like it was designed in the mid-90s. The only viable candidates are IBM’s Steve Mills and VMware’s Paul Maritz, who likely would not change a thing strategically at Microsoft. Microsoft shareholders should be grateful they have a CEO who has steadily grown both earnings and revenue, transitioned legacy products into the cloud, moved aggressively into new markets such as console gaming and Internet services, revived the mobile product, and is now transitioning the Windows product line towards a new generation of tablets and processors. Yes, Microsoft’s stock has been flat through the 2000s and the decade’s massive technology market transitions to cloud and smartphones. That’s a much better outcome than tanking like HP, Sun, Nokia, RIM and others, and Microsoft’s products are now very well positioned for the coming decade. Booyah, Ballmer! Has Content Become Advertising for Advertising?